Jim Lee Captures the Essence of the Punisher and Wolverine in this Two-Piece Signed Limited Edition Lithograph Set Depicting our Two Heroes Fighting Off the Ninjas. #607/2500. Production cel of Superman looking over another production cel of Superman on his back. Presented on a watercolor production background from Groovy Ghoulies. 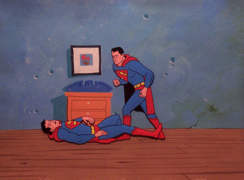 Vintage Filmation production art. Collage of 4 scenes from the first Spider-Man Movie starring Toby McGuire. THE X-MEN ADVENTURE 1983 Color Model Cel of Cyberaid. #1 Overall Size 11 x 14 Inches. AQUAMAN 1968 Hand-Inked Production Cel of Aqualad. Animated at Filmation Studios for Ducovny Productions. #2 Overall Size 11 x 14 Inches. AQUAMAN 1968 Hand-Inked Production Cel of Tusky Presented on a Color Laser Background. AQUAMAN 1970’S Production Cel of Aqualad. Ref. #LH-3. #3 Overall Size 11 x 14 Inches. AQUAMAN 1970’S Production Cel of Aqualad. Ref. #LH-4. Production Cel of Aquaman Along with Corresponding Cel of Water/Whirlpool Being Created by his Spinning. Ref. #2. Presented on a color laser background of an underwater scene. #4 Overall Size 11 x 14 Inches. 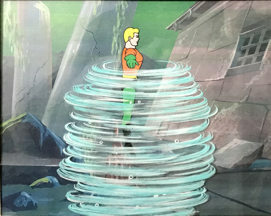 AQUAMAN 1970’S Production Cel of Aquaman Along with Corresponding Cel of Water/Whirlpool Being Created by his Spinning. AQUAMAN 1968 Production Cel of Aquaman. Ref. #35. #5 Overall Size 11 x 14 Inches. AQUAMAN 1970’S Production Cel of Aquaman. Ref. #R44. AQUAMAN- (THE SUPERMAN / AQUAMAN / BATMAN SHOW) 1968 Animation Drawing of Tusky. #6 Overall Size 11 x 14 Inches. 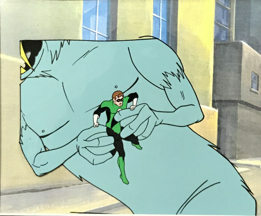 Hand-Inked Production Cel of the Green Lantern in the Clutches of a Huge, Blue-Gray Beast. Animated at Filmation Studios for Ducovny Productions. Presented on a color laser background. HAWKMAN 1980’S Animation Drawing of Hawkman in Flight. Ref. #33. #7 Overall Size 11 x 14 Inches. HAWKMAN 1968 Hand-Inked Production Two-Cel Setup of Hawkman Presented on a Color Laser Background. #8 Overall Size 11 x 14 Inches. 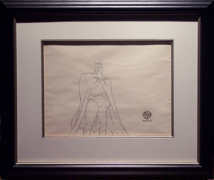 HAWKMAN- (THE SUPERMAN / AQUAMAN / BATMAN SHOW) 1968 Animation Drawing of Hawkman. Production drawing of Batman from the Be A Clown episode. Custom Matted and Framed and bears the WB Logo. Comes with the original Warner Bros. Studios certificate. TEEN TITANS 1970’S Production Cel of Captain Marvel, Jr. Ref. #MJ5. TEEN TITANS 1970’S Production Cel of the Doctor Along with his Caterpillar Equipped with a Miniature Radio. Ref. #B7. TEEN TITANS - (THE SUPERMAN / AQUAMAN / BATMAN SHOW) 1968 Animation Drawing of Aqualad. TEEN TITANS - (THE SUPERMAN / AQUAMAN / BATMAN SHOW) 1968 Animation Drawing of Wonder Girl. TEEN TITANS - (THE SUPERMAN / AQUAMAN / BATMAN SHOW) 1968 Animation Drawing of Wonder-Lad. THE ATOM 1970’S Multi-Cel Production Setup of the Atom. Ref. #R4. THE ATOM 1968 Animation Drawing of the Atom in his Secret Identity (Palmer) Along with Two Other Characters (Blake & Simms). THE ATOM 1968 Hand-Inked Production Two-Cel Setup of the Atom Getting out of the Way in a Hurry. Presented on a Watercolor Production Background. THE ATOM 1968 Hand-Inked Production Cel of the Atom. Animated at Filmation Studios for Ducovny Productions. THE ATOM 1968 Hand-Inked Production Two-Cel Setupf of the Atom. Animated at Filmation Studios for Ducovny Productions. THE ATOM- (THE SUPERMAN / AQUAMAN / BATMAN SHOW) 1968 Animation Drawing of the Atom. THE FLASH 1968 Hand-Inked Production Cel of the Flash. Animated at Filmation Studios for Ducovny Productions. HE FLASH- (THE SUPERMAN / AQUAMAN / BATMAN SHOW) 1968 Animation Drawing of the Flash. THE FLASH- (THE SUPERMAN / AQUAMAN / BATMAN SHOW) 1968 Animation Drawing of the Flash. THE GREEN LANTERN 1968 Animation Drawing of the Green Lantern Escaping the Clutches of the Beast. Animated at Filmation Studios for Ducovny Productions. THE GREEN LANTERN 1968 Animation Drawing of the Green Lantern in his Secret Disguise (Hal Jordan). Animated at Filmation Studios for Ducovny Productions. SPIDERMAN 1977 Animation Drawing of Spiderman. SUPER-FRIENDS 1977 Animation Drawing of One of the Super-Friends, Signed by Donna Purcell. SUPER-HEROES 1970’s Production Cel of the Hulk. THE X-MEN ADVENTURE 1983 Color Model Cel of Scott Summers (Cyclops) and Peter Rasputen (Colossus). SUPERFRIENDS 1977 Animation Drawing of Spiderman and Spiderwoman. SUPERFRIENDS MODEL SHEET 1977 Alex Toth Designed Studio Print (Xerox) Model Sheet of Aquaman Riding Storm, his Mount. Reused in the 1977 Series. 2 Images. SUPERFRIENDS MODEL SHEET 1977 Alex Toth Designed Studio Print (Xerox) Model Sheet of Aquaman. Originally Created in 1973, tReused in the 1977 Series. 3 Images. SUPERFRIENDS MODEL SHEET 1977 Alex Toth Designed Studio Print (Xerox) Model Sheet of Batman & Robin. Created in 1973, Reused in the 1977 Series. 7 Images. SUPERFRIENDS MODEL SHEET 1977 Alex Toth Designed Studio Print (Xerox) Model Sheet of Batman & the Batmobile. Reused in the 1977 Series. 5 Images. SUPERFRIENDS MODEL SHEET 1977 Alex Toth Designed Studio Print (Xerox) Model Sheet of Batman. Originally Created in 1973, Reused in the 1977 Series. 8 Images. SUPERFRIENDS MODEL SHEET 1977 Alex Toth Designed Studio Print (Xerox) Model Sheet of Batman. Originally Created in 1973, Reused in the 1977 Series. 3 Images. SUPERFRIENDS MODEL SHEET 1977 Alex Toth Designed Studio Print (Xerox) Model Sheet of Clark Kent. Originally Created in 1973, Reused in the 1977 Series. 7 Images. SUPERFRIENDS MODEL SHEET 1977 Alex Toth Designed Studio Print (Xerox) Model Sheet of Robin. Originally Created in 1973, Reused in the 1977 Series. 8 Images. SUPERFRIENDS MODEL SHEET 1977 Alex Toth Designed Studio Print (Xerox) Model Sheet of Robin. Originally Created in 1973, Reused in the 1977 Series. 6 Images. SUPERFRIENDS MODEL SHEET 1977 Alex Toth Designed Studio Print (Xerox) Model Sheet of Robin. Originally Created in 1973, Reused in the 1977 Series. 3 Images. SUPERFRIENDS MODEL SHEET 1977 Alex Toth Designed Studio Print (Xerox) Model Sheet of Superman . Originally Created in 1973, Reused in the 1977 Series. 4 Images. SUPERFRIENDS MODEL SHEET 1977 Alex Toth Designed Studio Print (Xerox) Model Sheet of Superman & as Clark Kent. Created in 1973, Reused in the 1977. 3 Images. SUPERFRIENDS MODEL SHEET 1977 Alex Toth Designed Studio Print (Xerox) Model Sheet of Superman. Originally Created in 1973, Reused in the 1977 Series. 4 Images. SUPERFRIENDS MODEL SHEET 1977 Alex Toth Designed Studio Print (Xerox) Model Sheet of Superman. Originally Created in 1973, Reused in the 1977 Series. 5 Images. SUPERFRIENDS MODEL SHEET 1977 Alex Toth Designed Studio Print (Xerox) Model Sheet of Wonder Woman. Created in 1973, Reused in the 1977 Series. 4 Images. SUPERFRIENDS MODEL SHEET 1977 Alex Toth Designed Studio Print (Xerox) Model Sheet of Wonder Woman. Created in 1973, Reused in the 1977 Series. 6 Images. SUPERFRIENDS MODEL SHEET 1977 Alex Toth Designed Studio Print (Xerox) Model Sheet of Wonder Woman. Originally Created in 1973, Reused in the 1977 Series. 8 Images. SUPERFRIENDS MODEL SHEET 1977 Studio Print (Xerox) Model Sheet of Gleek. 3 Images. SUPERFRIENDS MODEL SHEET 1977 Studio Print (Xerox) Model Sheet of Gleek. 5 Images with special notations. SUPERFRIENDS MODEL SHEET 1977 Studio Print (Xerox) Model Sheet of Gleek. 5 Images. SUPERFRIENDS MODEL SHEET 1977 Studio Print (Xerox) Model Sheet of Gleek. 6 Images. SUPERFRIENDS MODEL SHEET 1977 Studio Print (Xerox) Model Sheet of Jayna. 3 Images. SUPERFRIENDS MODEL SHEET 1977 Studio Print (Xerox) Model Sheet of Jayna. 5 Images. SUPERFRIENDS MODEL SHEET 1977 Studio Print (Xerox) Model Sheet of Superman, Wonder Woman, Aquaman, etc... 8 Images in a Size Comparison Chart. SUPERFRIENDS MODEL SHEET 1977 Studio Print (Xerox) Model Sheet of the Bat Plane. 3 Images. SUPERFRIENDS MODEL SHEET 1977 Studio Print (Xerox) Model Sheet of the Batmobile Interior. SUPERFRIENDS MODEL SHEET 1977 Studio Print (Xerox) Model Sheet of Zan & Jayna Summoning the SuperFriends with their Rings. 3 Images. SUPERFRIENDS MODEL SHEET 1977 Studio Print (Xerox) Model Sheet of Zan & Jayna. 2 Images. SUPERFRIENDS MODEL SHEET 1977 Studio Print (Xerox) Model Sheet of Zan & Jayna. 3 Images. SUPERFRIENDS MODEL SHEET 1977 Studio Print (Xerox) Model Sheet of Zan. 3 Images. SUPERFRIENDS MODEL SHEET 1977 Studio Print (Xerox) Model Sheet of Zan. 4 Images. SPIDER-MAN AND HIS AMAZING FRIENDS 1981 Color Model Cel of Aunt May. Four Head Shots. SPIDER-MAN AND HIS AMAZING FRIENDS 1981 Color Model Cel of Aunt May. Three Full Images as Drawn by Rick Hoberg. SPIDER-MAN AND HIS AMAZING FRIENDS 1981 Color Model Cel of the Black Knight. THE FLASH 1970’S Animation Drawing of the Flash Running. Ref. #F-12. THE FLASH 1970’S Animation Drawing of the Flash Running. Ref. #F-4. 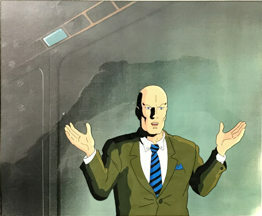 THE NEW X-MEN ADVENTURES 1994 Production Cel of Beast Presented on a Color Laser Background. 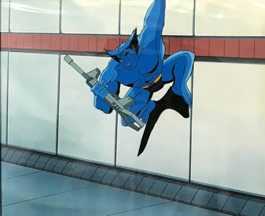 THE NEW X-MEN ADVENTURES 1994 Production Cel of Beast. This is a Vertical Cel and Background. Presented on a Watercolor Production Background. 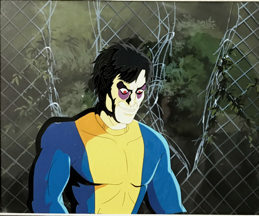 THE NEW X-MEN ADVENTURES 1994 Production Cel of Cyclops. This is a Vertical Cel and Background. Presented on a Watercolor Production Background. THE NEW X-MEN ADVENTURES 1994 Production Cel of Jubilee Looking Right. Presented on a Color Laser Background. THE NEW X-MEN ADVENTURES 1994 Production Cel of the X-Men. Presented on a Watercolor Production Background. THE NEW X-MEN ADVENTURES 1994 Production Cel of Rogue Presented on a Color Laser Background. THE NEW X-MEN ADVENTURES 1994 Production Cel of Storm Presented on a Color Laser Background.